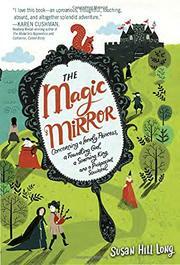 A foundling girl searches for the man she saw in a magic mirror. Margaret—sometimes called Maggot—lives in a harsh, dirty, and often disgusting medievallike world (largely inhabited, as these worlds are, by white characters). Taken in by a woman named Minka after she was found alone in a church, Margaret has been persecuted all her life because of her twisted leg. Even Minka, who the narrative asserts really loves Margaret, hits and berates her. When a friendly peddler saves Margaret from the village bullies, she trades her crutch for a magic mirror that shows the beholder’s true desire. Spying a wild-eyed man in the glass, Margaret decides to journey to find him. Along the way, she falls in with robbers and pilgrims, and all problems unravel with unbelievable ease—most by the convenient appearance of just the right people at the exact moments they’re needed. Arriving in the capital, Margaret is believed to be the long-thought-dead princess, and it turns out that everyone in the story is intimately connected—a coincidence that adds to a generally implausible plot. Fans of body humor will find much to entertain in the profuse number of farts and burps.